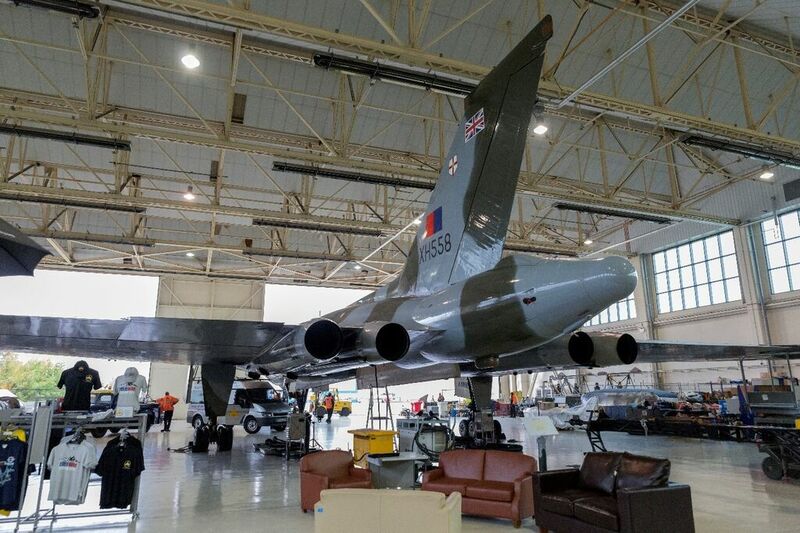 The latest blog submitted to us here at #twitterVforce comes courtesy of Sam Scrimshaw. 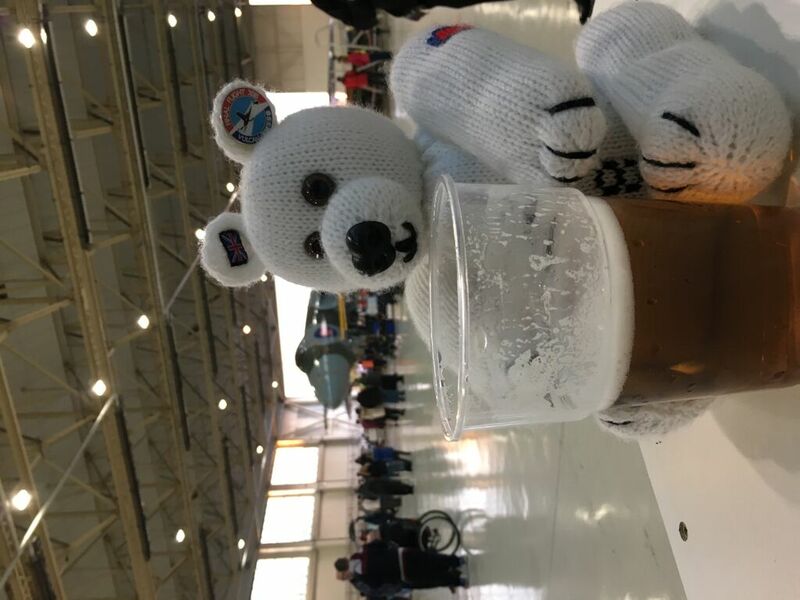 Sam has been volunteering with XH558 for nearly 2 1/2 years in the Hangar and at Air Shows up and down the country in the Vulcan Village. 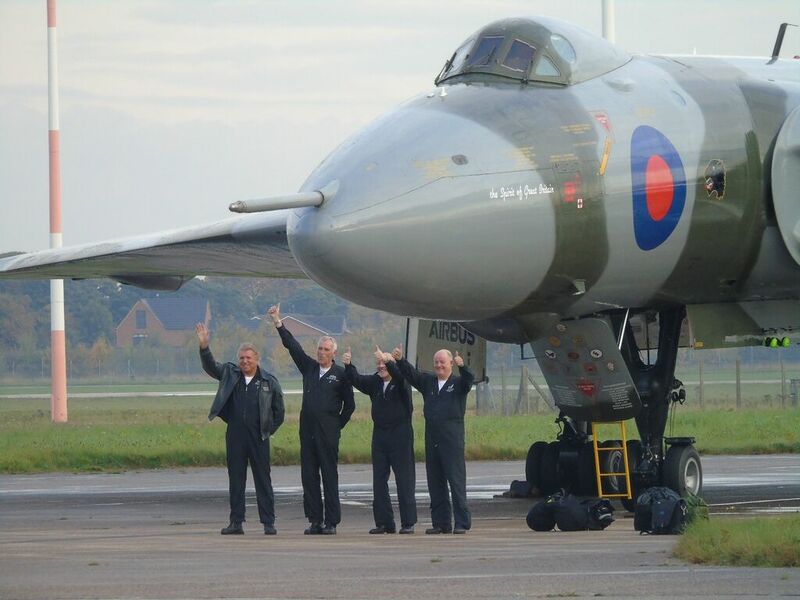 For those of you who attended #OperationFinningley back in March you may well remember him as being our Official #twitterVforce auctioneer. Enjoy the read and marvel at the pictures. 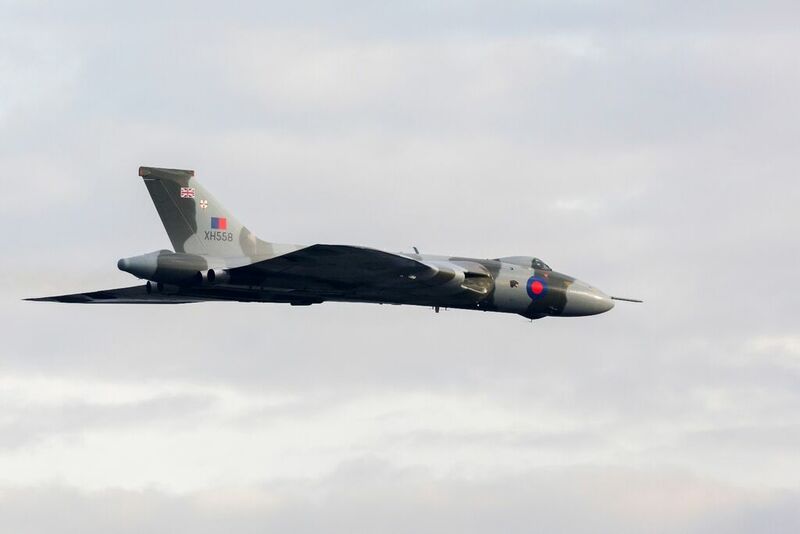 As you will know, Wednesday 28th October 2015 saw the final ever flight by XH558, the last airworthy 4-jet engined All-British Aircraft and V-Bomber in the world. 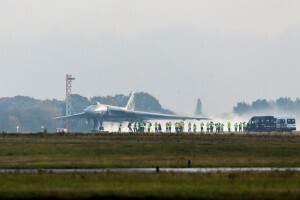 The flight was shrouded in secrecy over fears that too many supporters would turn up and block access to the airport, potentially causing catastrophic impacts to the Vulcan to the Sky Trust, as any costs incurred would be passed on to them. But, despite these fears, 558 was ready to go. 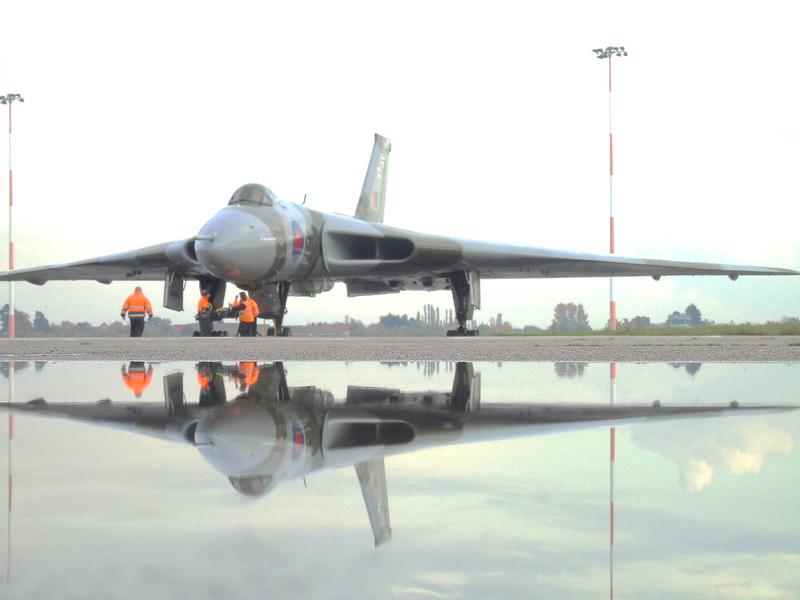 Signed of as airworthy for the final time by ‘Taff’ Stone and the engineering team before being handed over to the aircrew, Just to wait for a gap in the truly Great British Autumnal weather. 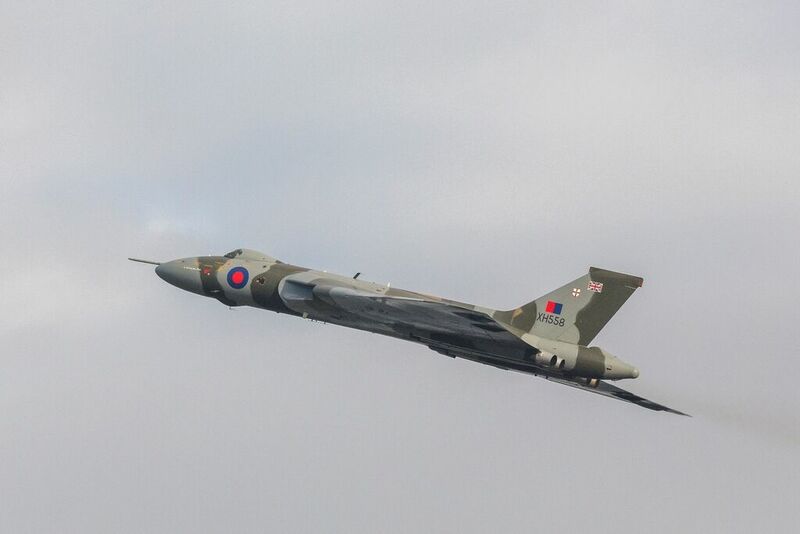 It didn’t look good – grey clouds, rain and fog shrouded the airport in gloom! 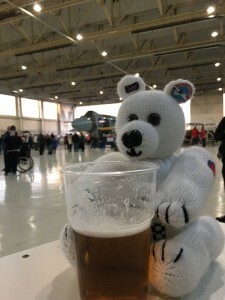 However, in true British fashion, the gathered guests remained optimistic that XH558 would fly – despite the gloomy outlook. 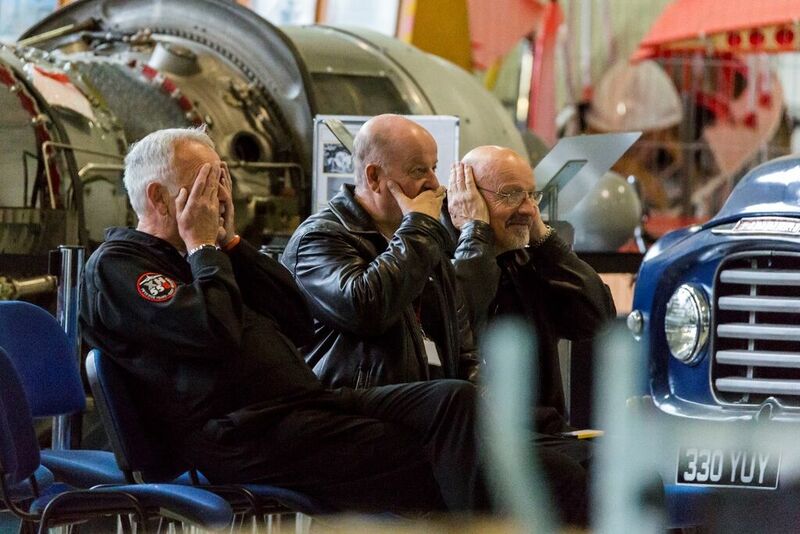 At about 10:00 the visitors in the hangar were informed that the weather in the morning would not allow XH558 to fly, and thus would mean that XH558 would miss the timeslot allocated by the airport to her. (Sigh, I guess we might not see one more flight). However, the airport had agreed to offer 558 another opportunity to make the historic final flight later on in the day, where the weather looked more promising (Yay!). Tours were offered around the aircraft to the journalists to help to pass the time, with some trying their hand on the Vulcan flight Simulator – Most flights ending in balls of flames and twisted wreckage to remarks of “How do they actually fly it? You can’t see where you’re going! !” (Now imagine doing it over the Soviet Union at the height of the Cold War when you had curtains across the windows, It really isn’t easy!) – While others took the opportunity to film interviews with the crew for the day. 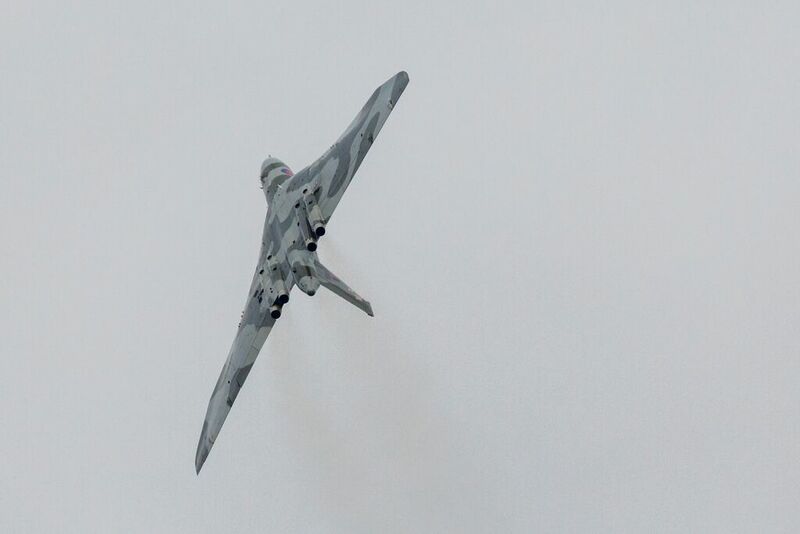 With lunch being served, the news filtered through that the weather conditions had improved enough to allow XH558 to fly; the rain had stopped; the clouds were breaking and the fog was lifting. Once again, 558 had her guardian angel watching over her, as had been the case so many times during and since the restoration. 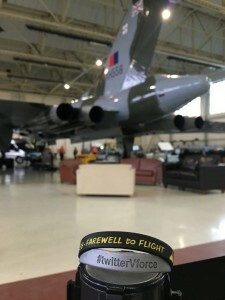 The aircraft was ready, the crew were ready and (Finally!) the weather was ready too. 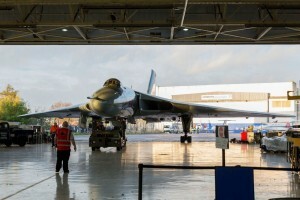 The six great hangar doors were opened and XH558 exited to fly for the final time. 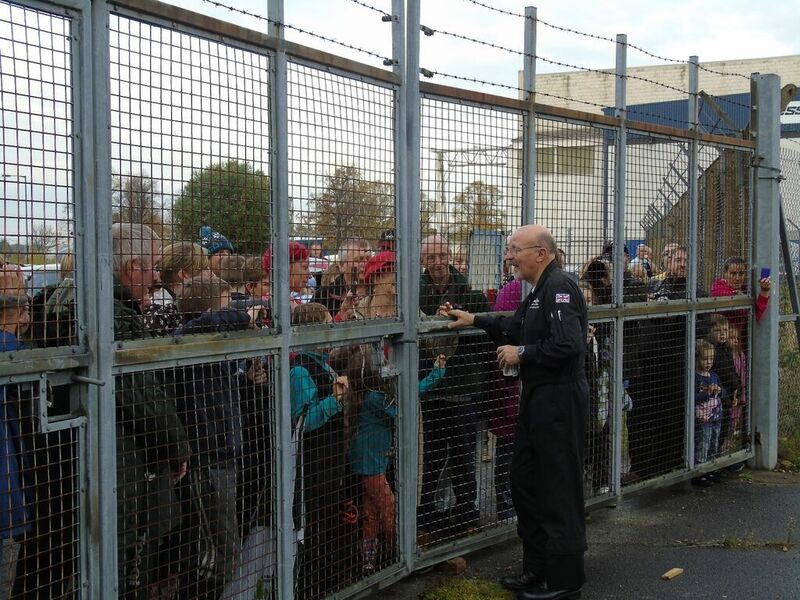 There was already a gathering of people outside the fence, most had been there all day (some had been there all week just hoping that they would see that final flight! ), but they had sat outside through wind and rain and this was what they had come to see. News spreads quickly, especially when it’s the final flight of one of the most loved display aircraft ever, and more people were turning up. By now, XH558 was out on the pan with the team carrying out final checks before engine start whilst the assembled press were piling into minivans to take them to their vantage point out on the airfield. With the live stream up and running, thousands of people were able to witness XH558 start up, Taxi and take off for the final time before being grounded. 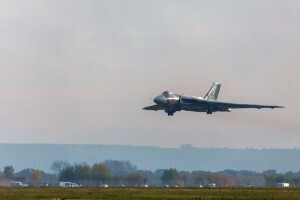 And what a take-off it was! 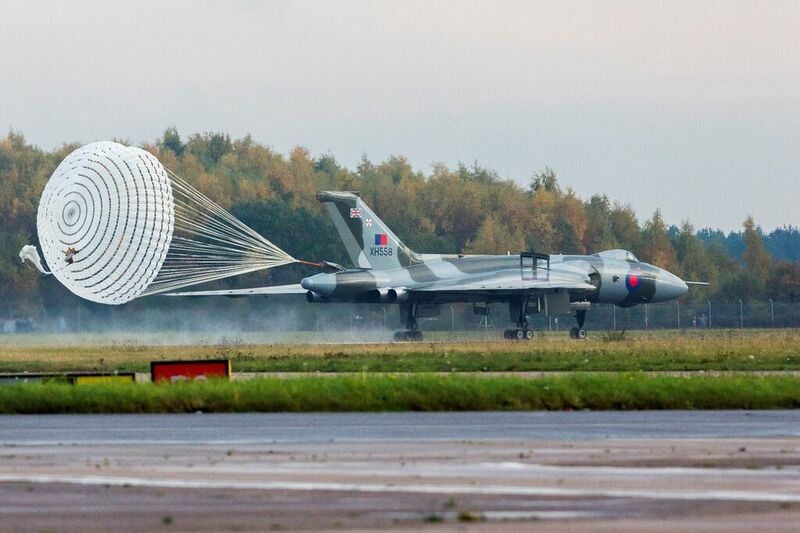 The wet runway creating a dramatic spray behind XH558 as she thundered down the runway and leapt into the air for the final time, with Bill Ramsey holding 558 at around 100ft while the gear retracted before pulling up into one of the most perfectly executed wingovers I’ve seen. Lovely stuff! Wide circuit, then time for a fast pass down the runway. Airbrakes deployed, Break left, wings covered in fluff and contrails from the wingtips! Wide circuit, Gear down, lined up, Gear up, pass beck down the runway, climbing break left, more fluff! Gear down again, final approach, Touchdown! Well, that’s it. 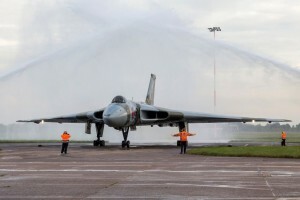 XH558 has landed for the final time – or so we thought! 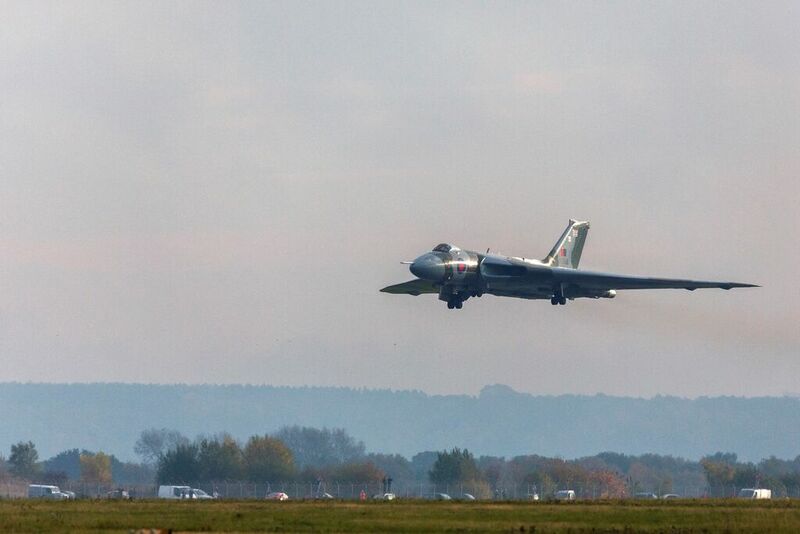 Airbrakes retracted, Engines spooling up and up she goes again! Getting us all emotional too early! Circuit back around, gear down, airbrakes out, FINAL final approach and touchdown. 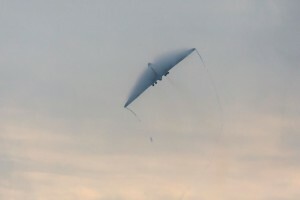 Brake parachute deployed, and the tears start to flow from all around. 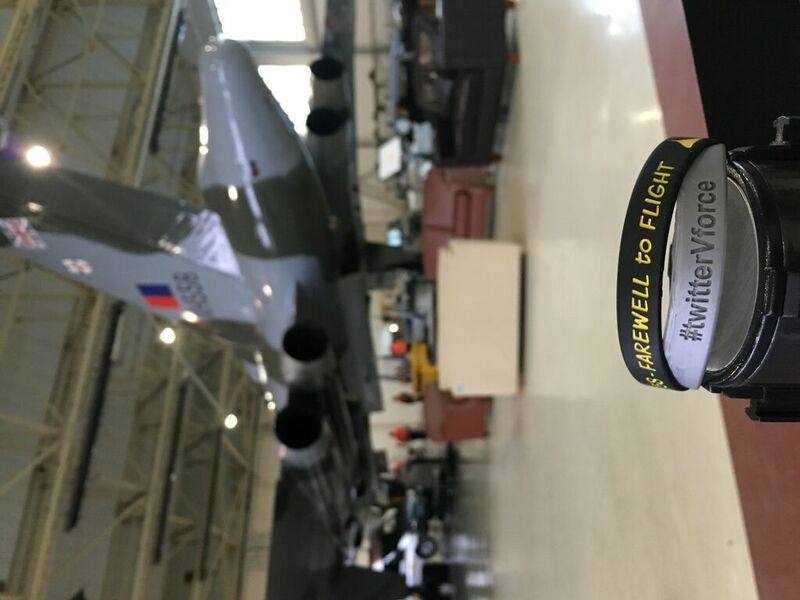 We always knew this day would come and that XH558 would always have a final flight, but now that it’s over the realisation strikes. That was the last time anybody will see a Vulcan fly. The long taxi back to stand took forever. 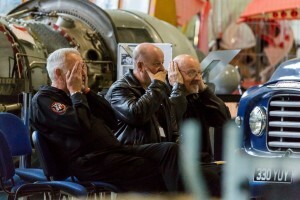 Maybe it was just the sadness sinking in, maybe it was the crew wanting to savour every last minute of those final moments they had. Maybe it was both. 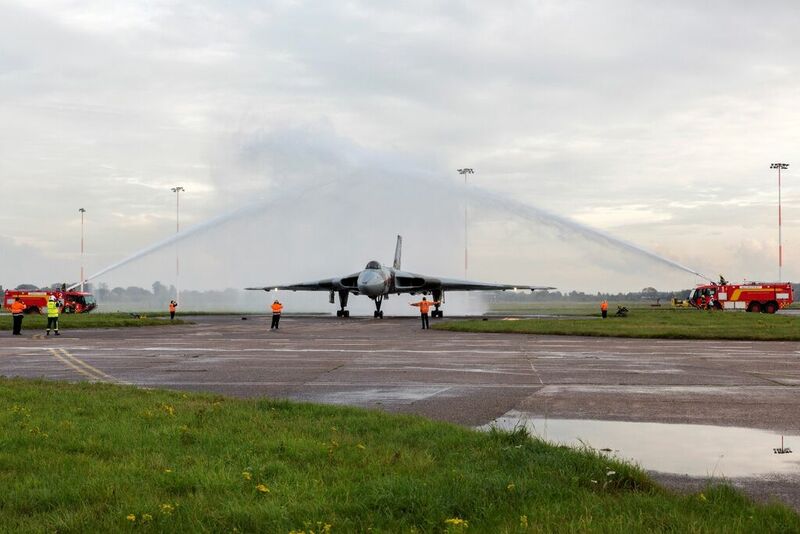 As XH558 turned onto the pan, the airport fire and rescue service paid their tributes. 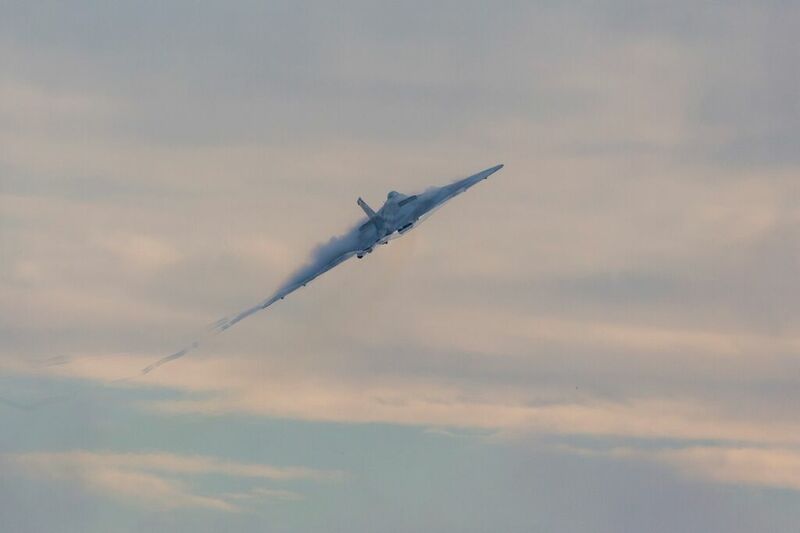 A fitting Water Salute making a perfect arch over the last flying Vulcan. Damn, that’s set everyone going again! But it isn’t just the aircrew that deserve all the applause. The tireless work of the engineers, more often hidden away behind the hangar doors than not, that actually allows the aircrew to take 558 and show her off to so many people, deserves huge plaudits. 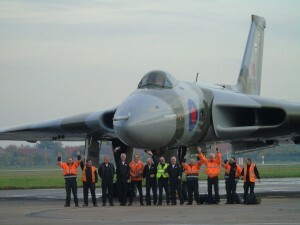 10 years ago, if you asked anyone if a Vulcan would ever fly again, they would have told you that you were mad! Without the hard work and dedication that they have put in over that time, none of this would ever have happened. So naturally, they posed for a photo too! And that is nearly it. XH558 was towed into the hangar, nose in. A new configuration for a new era! The fence was full. 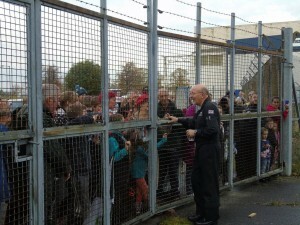 Everybody wanting to catch that final glimpse of 558’s second life who could get to Doncaster was there, and, in a gesture of thanks, Andrew Edmondson invited them all to come into the hangar to get up close with XH558. And so the day ended as many had done so throughout this summer. 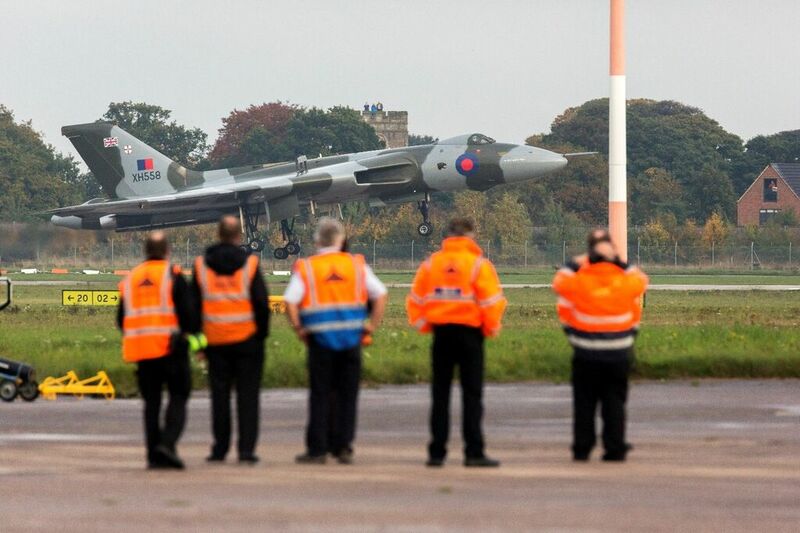 XH558 surrounded by her fans, but this time there wasn’t the sense of excitement you have at an air show, it was more of an air of sadness with a very generous helping of pride! And so that brings an end to XH558’s wonderful, magnificent, inspirational, awe-inspiring (I’m running out of nouns here!) flying career. There’s been highs and lows, good times and bad, but through thick and thin, she has had the most amazing support from you, the general public. It may be over now, but her flying life will live on. In tales told by people who watched in awe as she howled overhead, to the multitude of YouTube videos showing her greatest moments.